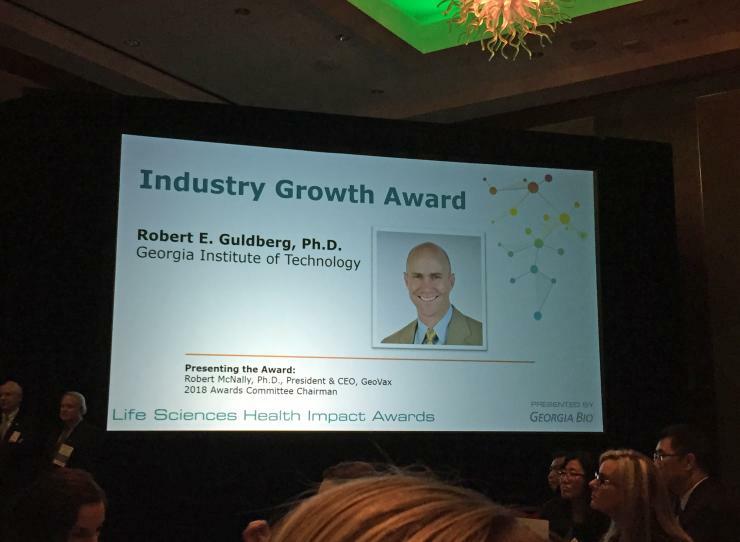 Bob Guldberg, executive director of the Petit institute for Bioengineering and Bioscience at Georgia Institute of Technology, took center stage Thursday night at the 2018 Georgia Bio Life Science Health Impact Awards Gala at the Cobb Energy Center. Guldberg, along with James Wehenmeyer, vice president of research and economic development at Georgia State University, received the Industry Growth Awards, the highest honors bestowed each year by Georgia Bio, the state’s life science advocacy and business association, now in its 20th year. 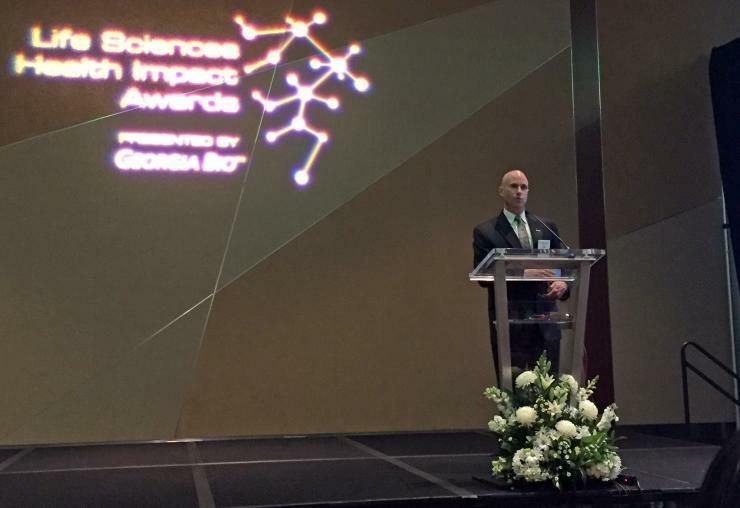 The award recognizes individuals in the public and private sectors who have made extraordinary contributions to the growth of Georgia’s life sciences industry. 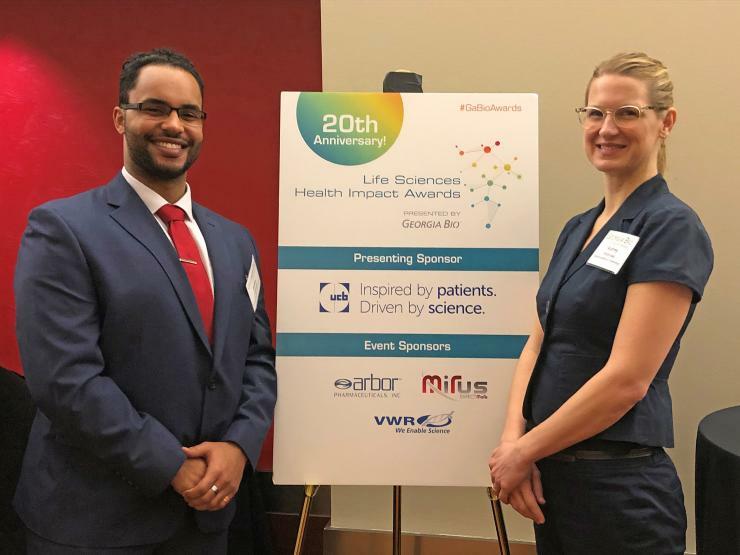 Georgia Tech and the Petit Institute were well represented at the awards podium as nearly 300 of the state’s life science industry leaders gathered to celebrate the contribution and achievements of people and organizations. In addition to Guldberg, other award winners with Tech connections included Sherry Farrugia (chief operating and strategy officer of the Pediatric Technology Center, a partnership of Georgia Tech and Children’s Healthcare of Atlanta), who won a Community Award, and the NSF Engineering Center for Cell Manufacturing Technologies (CMaT) at Georgia Tech, which won a Deal of the Year Award. “We are excited to recognize the individuals and organizations improving and saving lives worldwide through their healthcare innovations and leadership here in Georgia.” said Russell Allen, president and CEO of Georgia Bio. GEORGIA BIO INDUSTRY GROWTH AWARDS: Presented to two people who have made an extraordinary contribution to the growth of the life sciences industry in Georgia. • James Weyhenmeyer, Ph.D., VP Research & Economic Development, Georgia State University and Chairman, GSU Research Foundation Inc.
PHOENIX AWARD: Presented to two Georgia honorees who have forged academic and industry relationships that will drive translation and lead to new treatments and cures. This award is sponsored by the Metro Atlanta Chamber. DEALS OF THE YEAR AWARDS: Presented to one or more companies or institutions for the most significant financial or commercial transactions closed from November 1, 2016-October 31, 2017, based on the importance of the transaction to Georgia’s life sciences industry. COMMUNITY AWARDS: Presented to a small number of individuals, companies or institutions whose contributions to Georgia’s life sciences community are worthy of special recognition. INNOVATION AWARDS: Presented to the department, institution, company or individuals who are forging new ground by thinking outside traditional paradigms to create some unique technology. • George Hsu, M.D., Chief Medical Officer / Interim CEO, Cathaid Inc. EMERGING LEADER OF THE YEAR AWARDS: Presented to young individuals who have made a significant impact on the life sciences industry through their studies or employment. TEACHER OF THE YEAR AWARD: Presented to a Georgia biotechnology high school teacher who exhibits excellence in STEM teaching and support for the biotechnology pathway. For a list of past Georgia Bio Industry Growth Award recipients, click here.